Can I just say, wow! So many people have torn their ACLs and more! 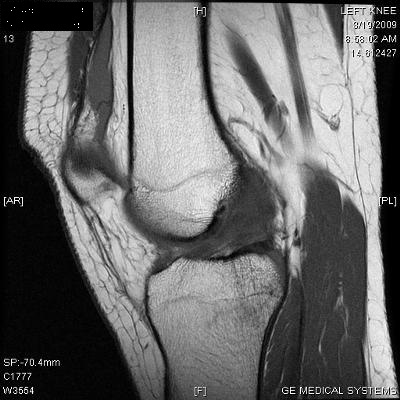 ACL tears kind of run in our family; my dad's done both of his and both of my brothers have done their left knees (one playing rugby and one mountain biking)... I also know about 5 of my very good friends who've done theirs either playing netball or Rugby. 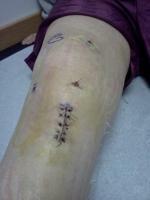 I ruptured my ACL on March 13th 2009 when playing netball for our school 1st team against a very sporty school. 8 minutes before the end of the match I ran forward for the ball, jumped in the air and suddenly decided i wanted to go in the other direction... so my foot went one way and the rest of me kept on going straight (at quite some speed). My knee slipped right out of place and popped back in again. I was on the concrete floor screaming (a couple of my team-mates saw and said it looked 'disgusting'... lovely. I Went to A&E the next day and received and X-ray even though I had an inkling that I'd done exactly what most of my family have done, my ACL. I was referred to a very good knee specialist surgeon who took one look at my MRI scan and said I had ruptured the whole ACL ligament. Even though I kinda knew I'd done it, I burst into tears from the shock of having to go under the knife as I couldn't picture life without sports. what I still have - Asics Netball trainers. I usually play netball inside or on that squishy flooring designed to take in shock from landing, so playing on the concrete was a bit intimidating as I've had bad scars from the 'non-contact' game on that surface. Anyhoo, my operation date is on 23rd June 2009 so just under a week to go. I'm trying to keep positive about the whole experience as my 23yr old rugby player brother I mentioned earlier has had two ACL reconstructions on his left knee and is playing for a rugby team in the Dubai 7's towards the end of this year which is promising. He's always telling me there's nothing to worry about and I'll be glad I've done the op so I think he's telling the truth as he's been through it more than enough times :P.
I'm having the Hamstring graft as opposed to the Patella one... What do people think of these two?? Is one better than the other? The one upside of this is I get to miss the last week of A-level work! (Obviously have to catch up though :(.) At least it gives me something else to do when I?m temporarily unable to move rather than just physiotherapy. Last question; is anyone else in the same or similar situation to me and doing/done their A-levels (or equivalent)? My PE teacher is recommending me NOT to do PE next year in case there are any complications, however I love the subject and it's mostly theory anyway until about April next year where we have our physical assessments (mines netball obviously :P).